AT&T Announces BlackBerry Curve 8310 | BlackBerry Blast! AT&T Inc. and Research In Motion have announced the availability of the BlackBerry® Curve™ 8310, which adds the power of built-in GPS (Global Positioning System) to the popular BlackBerry Curve, which was first introduced in the U.S. through AT&T. In addition to GPS, the new BlackBerry Curve 8310 advances the original design with two new eye-catching colors for AT&T customers. 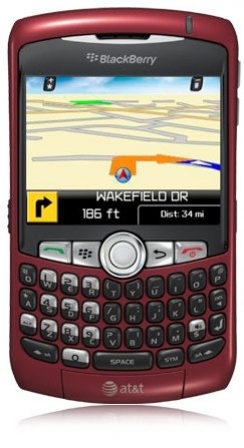 With the BlackBerry Curve 8310 handset's built-in GPS capabilities, customers can take advantage of location-based applications and services such as TeleNav® GPS Navigator™, which provides GPS-enabled turn-by-turn voice and on-screen directions that feature colorful 3-D moving maps and traffic alerts with rerouting. Customers will find TeleNav GPS Navigator useful in vehicles as well as while walking. Building on its incredible visual appeal, the BlackBerry Curve 8310 from AT&T is available in two new eye-catching colors — titanium and red. The red model is available in the U.S. exclusively from AT&T.